Linguists estimate that half of the world’s languages will disappear this century. New York City is a living language lab where there are more spoken and endangered languages than anywhere else in the world. New York is home to over 700 languages, and many of these are in danger of being lost. This Endangered Language Series is part of the project’s call to action to preserve the world’s linguistic diversity and an exploration of the richness inhabiting all languages. The portraits were made in and around New York City between July 2014 and January 2015. All images were taken with a circa 1930’s Eastman view camera on 5×7 inch black & white film and then digitally altered. In its methods and aesthetic approach, Mother Tongues is an outgrowth of Yuri Marder’s The Exile Project a series begun in 1992 which features portraits of people from all over the world who live in one language but have their hearts in another. The endangered language series asks each collaborator to consider basic questions: what happens to the mother tongue when it exists in a state of cultural or physical separation? How do words and stories change when their mode of expression is threatened? The responses form handwritten quotes which are then etched into the image. In this way text and body are juxtaposed to form culturally revealing yet highly personal narratives. Mother Tongues is a collaborative project by photographer Yuri Marder, videographer Donnetta Bishop-Johnson, and linguist Daniel Kaufman. The images in this series were exhibited at the Mother Tongues exhibition at City Lore Gallery in New York City in 2015. Donnetta Bishop-Johnson is a theater producer and videographer based in NYC. Raised in the Crown Heights section of Brooklyn, her career has been influenced by the intersection of cultural forces that have continuously inspired and challenged the lives of New York City residents to this day. organization that documents endangered languages spoken by immigrant communities in NYC and educates the public about linguistic diversity. Yuri Marder has been doing photographic projects based upon language, identity, and exile for the past 20 years, inspired by the immigrants and refugees in his family. A two-time NYFA Fellowship recipient, he has done residencies at Light Work, MacDowell Colony, and ArtCenter South Florida in Miami. 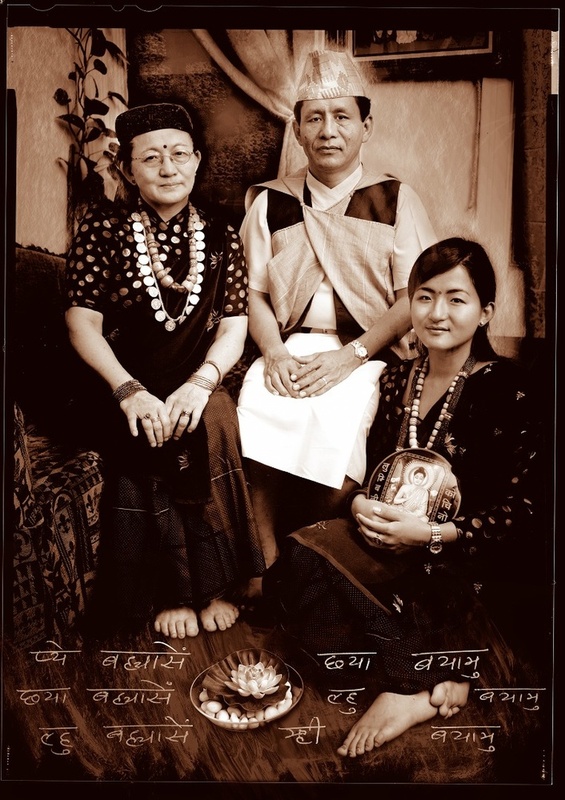 Image: Pictured here is Narayan Gurung and his family in traditional Gurung dress. Narayan is a former Gurkha soldier who has been working with linguistics students at the Endangered Language Alliance to document his language and culture.